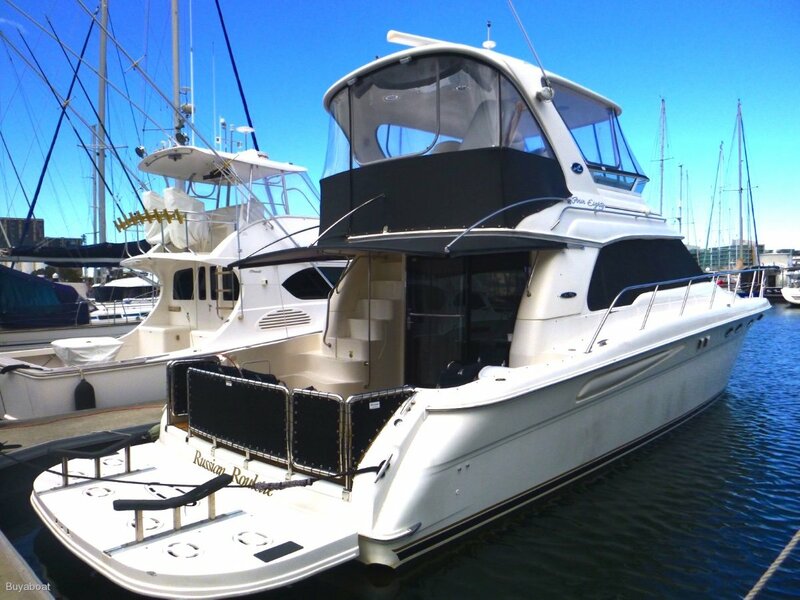 This magnificent maintained Forty Eight Sea Ray is like new, with every extra you could every want, air conditioned from the cabins to the flybridge, 3 cabins, large V berth with island bed, owners ensuite and separate shower. Port cabin has a double bed, Starboard cabin two singles. With additionally bathroom and separate shower. The main saloon is fitted with every modern convenience. The large leather lounge will unfold to a very comfortable bed at the push of a button. The galley is modern and well appointed. The large flybridge has plenty of room with every instrument you can imagine and more, Bow thruster, engine room cameras to name a few. A bar fridge and heaps of white leather seats and lounge area. Down the stairs the cockpit is large, with a hydraulic lift marline board that lowers into the water. "Russian Roulette" is not a gamble, but a Win for the new owner. Is beautifully appointed with 3 burner electric stove top, Electric microwave, Twin upright fridge freezer all nicely hidden behind galley doors, pull out extra bench space, double sink with modern fittings. Twin upright fridge freezer all nicely hidden behind galley doors, Flybridge bar fridge. Ice maker in the saloon. Owners Large V berth Cabin with island bed. Port Cabin with double Bed, Starboard Cabin has two Single beds in a L shape, Lounge in main saloon folds down electrically to make a double bed. 2 Toilets, one Owners separate toilet, One on Port side with separate toilet. Both electric Vacuum flush with heaps of cupboard space, hand basins and nicely appointed. Electric anchor winch with 50m of chain, fenders and ropes gallor. Life jackets, EPIRB, V sheet, fire extinguishers, 1st aid kit, torch, flares, full automated fire system. 4 wide screen Tvs, one in the Saloon and one each in all cabins, all with DVD. Clarion FM stereo and CD surround sound systems. LED lighting, 6 batteries, 2x 2000amp House, 2x Engine start, 2x Bow thruster. Each has its own battery charger connected to shore power. Engine room cameras. Air Conditioned cabins, saloon and Flybridge. Satellite antenna. Bow thrusters, Boat mooring hook, rocket launchers, hydraulic Marline board.